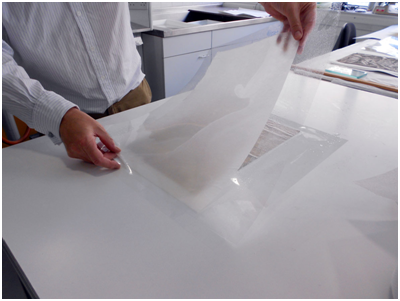 a sheet of Japanese tissue was cut slightly larger than the size of the print and placed on a sheet of Melinex. The tissue was then sprayed with water to gently humidify it and prepare it for lining. It was then lifted with the Melinex attached and positioned on top of the print.